UNITED NATIONS -- International terrorist groups carried out more attacks in Iraq and Syria in the last six months of 2018 than in any other country, and Islamic State extremists were primarily to blame, according to a new UN report circulated Wednesday. UN experts said in the report to the Security Council that IS and its affiliates "continue to pose the main and best-resourced international terrorist threat, while al-Qaeda remains resilient and active in many regions and retains the ambition to project itself more internationally." Even though IS's territorial losses in Iraq and Syria "have forced the group to abandon notions of controlling a geographical so-called 'caliphate' for the near future," the experts said its leaders continue to advance this aspiration in statements and online propaganda. The panel of experts said IS "has not yet been defeated" in Syria — contrary to US President Donald Trump's declaration of victory over the militant group in the country in December and announcement that all 2,000 US troops would be pulled out of Syria. IS fighters remain under "intense military pressure" in their stronghold in eastern Syria, the experts said, but have "shown a determination to resist and the capability to counter-attack." UN member states, who were not identified, estimate the number of IS militants active in Iraq and Syria at between 14,000 and 18,000, the experts said. This includes between 3,000 and 4,000 in the only remaining IS-held territory in Syria in the Middle Euphrates River valley near the Iraqi border, around the town of Hajin, they said. 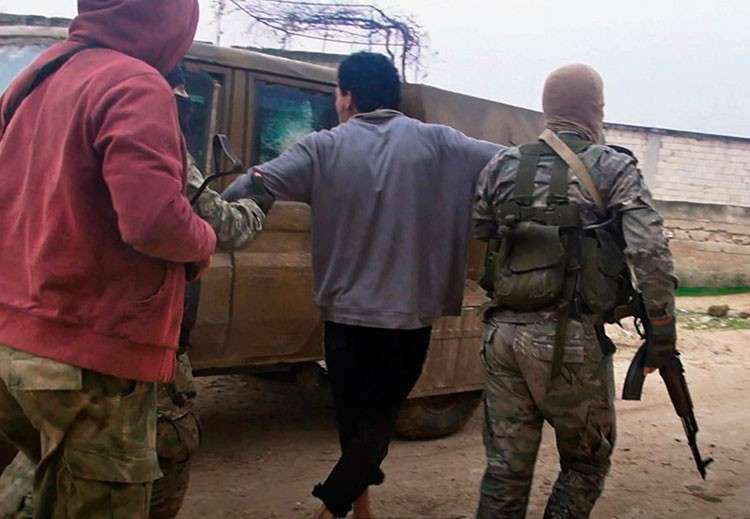 The experts said the al-Qaeda affiliated group Hayat Tahrir al-Sham — estimated by one UN member state to have approximately 20,000 fighters in Idlib province which is the last major opposition-held stronghold — "remains the largest terrorist group in the country." But another al-Qaeda affiliated group, Hurras Al-Deen, "is steadily growing and attracting fighters disillusioned with HTS," they said. In Iraq, the experts said member states report that the threat comes not only from IS remnants in the country but from IS fighters crossing the border from Syria. In mid-2018, they said IS successfully operated checkpoints in northern Iraq from which it ambushed Iraqi forces operating in the area. IS cells in Iraq "engage in activities aimed at undermining government authority, creating a sense of lawlessness, hampering societal reconciliation and increasing the financial burden of reconstruction and counter-terrorism," the experts said. "Such activities include kidnapping for ransom, targeted assassinations of local leaders and attacks against government utilities and services." Globally, the experts monitoring UN sanctions against IS and al-Qaeda said UN members remain concerned about the terrorist threat in Afghanistan, the southern Philippines, Yemen, Somalia, Libya, Africa's Lake Chad basin and the Sahel. In addition, they said, the issue of foreigners fighting for IS and al-Qaeda "remains acute," though the number of IS combatants returning home or relocating has been slower than expected. ARABIAN PENINSULA: "Member states assess that Al-Qaeda in the Arabian Peninsula is confined to Yemen, where it is under sustained pressure from military strikes against many of its leaders." Despite the pressure, the extremist group "remains resilient" and "is assessed to have recovered from the losses, reorganized and managed to shelter its elements among local communities." NORTH AFRICA: In the last six months of 2018, IS expanded its area of operations in Libya and "continues to represent a substantial threat, both locally and to neighboring countries." IS increasingly resorts to "hit-and-run operations" out of several points of concentration and "frequently raided and held inner-town police stations in shows of strength and to secure arms." IS also carried out attacks against the National Oil Corporation headquarters in Libya's capital Tripoli in September and against the Mabruk oil field in November. WEST AFRICA: An al-Qaeda-linked coalition known as JNIM "remains the leading and most dangerous terrorist group in the Sahel" as well as one of the extremist group's "most successful" affiliates. "JNIM maintains an asymmetric strategy" involving three types of attacks: frequent simple attacks using small arms or improvised explosive devices; more elaborate attacks combining small arms and IEDs, which are less frequent; and complex attacks with many combatants, indirect fire and several IEDs. EAST AFRICA: The militant group Al-Shabab based in Somalia "remains a strategic al-Qaeda affiliate, demonstrating resilience" and cooperating with Al-Qaida in the Arabian Peninsula. "It retains a large number of fighters with the capability to conduct high-impact attacks resulting in a large number of casualties and destruction of infrastructure." EUROPE: IS still poses "a significant threat in Europe despite its diminished ability to direct attacks." There have been fewer "lone actor" attacks in Europe recently, which suggests IS' "ability even to inspire such attacks may be declining." But communications have recently restarted between IS command and individuals in Europe. While the number of foreign fighters returning home in the last half of 2018 "was relatively low," they remain a threat as does the "radicalization of criminals within the prison system." CENTRAL AND SOUTH ASIA: IS "is seeking to expand its area of activity in Central Asia and has called for terrorist attacks targeting public gatherings, primarily in the Ferghana valley" which spreads across eastern Uzbekistan, southern Kyrgyzstan and northern Tajikistan. IS claimed responsibility for killing four foreign cyclists in Tajikistan last July. In Afghanistan, IS strongholds are in the east and its strength is estimated at between 2,500 and 4,000 militants.